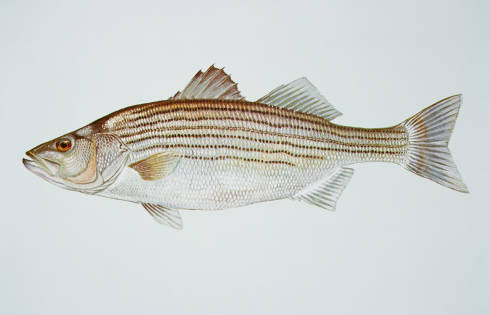 Striped bass (Morone saxatilis); illustration by Duane Raver / USFWS Digital Library: Striped bass (public domain image). Known for its size and fighting ability, the silver-flanked, iridescent striped rockfish (Morone saxatilis) has an olive-green back fading to light silver on its sides, with a white underside and dark stripes running from head to tail. Adult rockfish swim in the ocean but lay their eggs in fresh water. In spring the rivers and streams feeding Chesapeake Bay provide spawning grounds for Atlantic coast rockfish. Those born in the Bay spend their first 3 to 5 years there before migrating out to the Atlantic, where their life span may be as long as 30 years. The Maryland record for a rockfish caught in the Chesapeake Bay weighed 67.5 pounds. Declining stocks (attributed to over-fishing and pollution) forced Maryland to impose a moratorium on harvesting the species between 1985 and 1989. 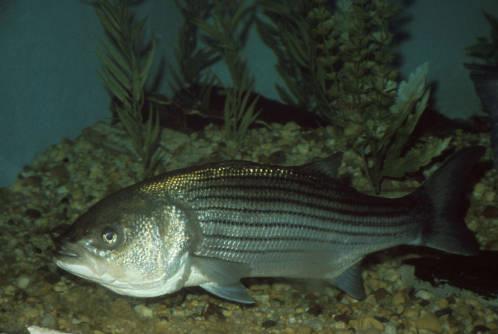 Striped bass; photo by USFWS Digital Library: Striped bass (public domain image).